Market Manila - Kalderetang Kambing (Goat Stew) a la Marketman - Beef/Lamb, etc. Without a doubt, the best Kalderetang Kambing I have ever cooked or tasted. But I guess I should disclose that I have never cooked it before. 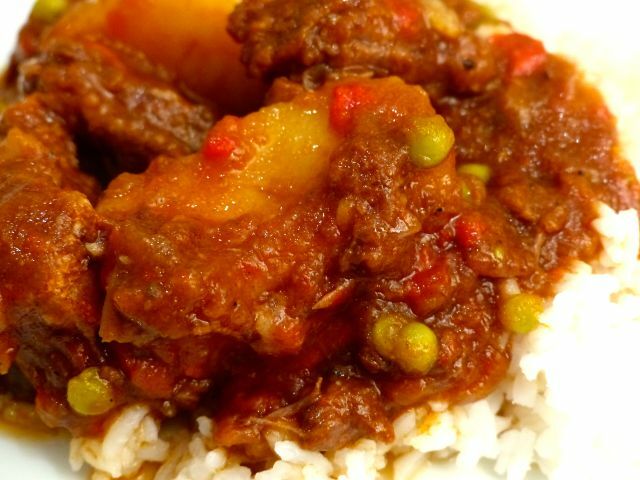 :) This stew was slightly gamey so you knew it was goat, but the meat was melt-in-your-mouth tender, coated in a spectacular sauce — thick, tasty, slightly spicy and unbelievably good with rice or mopped up with crusty french bread. A couple of days ago, I spied some frozen goat meat imported from Australia in the chillers at S&R. I bought two packages with perhaps a kilo each worth of meat and bones. I figured if I was going to attempt my first ever kalderetang kambing, then I was going to do it with farm raised and hygienically slaughtered meat. I have had some local goat before, in fact even some young ones we raised organically on our own property as well, and they were a bit too gamey for me, not to mention on the skinny side. I didn’t have a recipe for KK, and my mom never cooked this at home, but I have had it on several occasions in restaurants or homes of relatives, and knew what I WAS LOOKING for in a finished product. So I perused a few on-line recipes, searched through some of my cook books, and decided I had the underlying concept understood and hit the kitchen with no concrete recipe in mind. My view was this was a basic stew, with a few local twists, and I was going to wing it. Relatively confident, I even invited two friends over for dinner, but warned them that a failed experiment would mean some take-out pizza as the alternative. Many recipes soak the meat in vinegar, salt and pepper overnight before browning, but I was in a hurry, and counting on the meat not being too tough or gamey, and skipped this step. Instead, I patted the meat dry of moisture, drizzled some red wine vinegar on the goat meat, seasoned liberally with salt and pepper and let this rest for just 5 minutes while I got an enameled casserole on the heat. 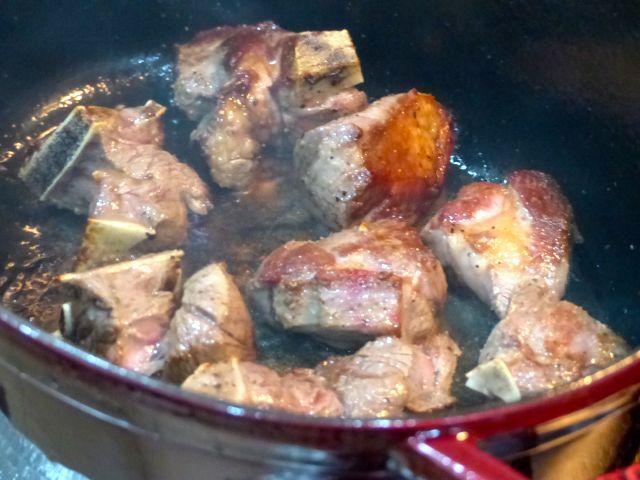 Add some olive oil to the hot casserole, then brown the goat meat in batches and let the pieces rest on a platter. Add a bit more olive oil, and sauté say 2 medium sized white onions coarsely chopped, two large ribs of celery chopped, 15 whole peeled shallots (they are small here), and say 6 cloves of garlic smashed. Season with salt and pepper. After a minute or two of gently stirring this all around, add say 1.5 cups of red wine (I used a very good Margaux, leftovers from a previous dinner) and let this reduce for 1 minute or so. 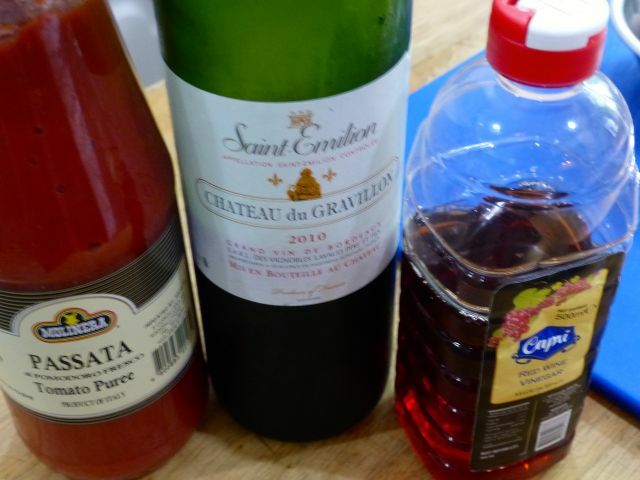 Next, I added a bottle (say 4 cups) of passata or tomato puree, a bit of water (just to wash out the bottle of tomato sauce) and about 3/4 of a can of beef broth. Let this come to a boil, throw in a bay leaf or two, then add the goat meat. Stir and let this “gurgle”, covered in the casserole for 3+ hours until the meat is tender. We cooked our pot of KK for a total of 3.5 hours. I realize the addition of wine is a major departure from a local kalderetang kambing recipe, but bear with me until you see the results. If you don’t want to use wine, just add more water or broth. About 45 minutes before the dish is finished, add two de-seeded and chopped red bell peppers, 2-3 carrots peeled, chopped, 2-3 potatoes, peeled and chopped, two chopped siling labuyo (bird’s eye chilies) and two tablespoons of reno liver spread to thicken and flavor the sauce. You can add say 20 green olives now, which I did, but you can also leave them out if you desire. Just before serving, add some fresh or frozen peas. Add more broth if it looks like its getting too thick. 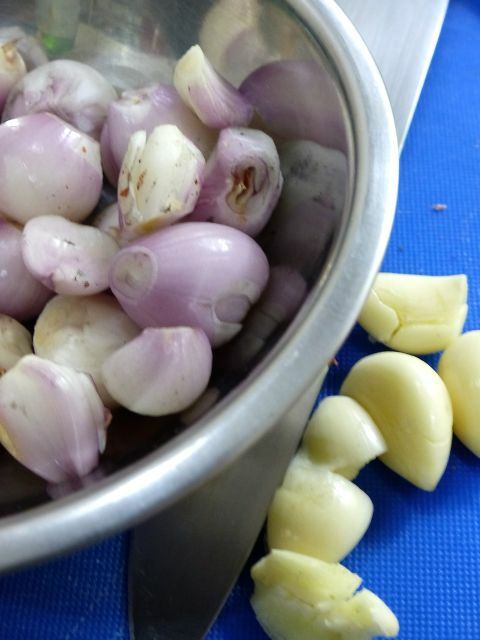 Season throughout with salt and pepper to get just the right balance of salty, piquant, spicy, etc. This first-time ever pot of KK turned out BRILLIANTLY. Absolutely delicious. Our guests, Canadians, thought it was the cat’s meow. We finished a huge platter full of the stew. Guests had it with a crisp baguette from Kayser, while I had it with steamed rice. Would definitely make this again. Now if only S&R had a steady supply of good quality goat meat! This dish, served in a foreign setting, would trump many stews by far, and I am pretty sure would win the hearts of locals and foreigners alike. Crossover pinoy food at its best. Delicious and incredibly satisfying. Having not had dinner, this is perhaps the worst post for me to read. Sigh. I basically cook beef caldereta the same way but no wine and at the last few minutes of cooking I put grated cheddar cheese to melt in the sauce. I remember my mom put a few tablespoons of rhum and she roasts the liver then pound it to thicken the sauce. Your version looks yummy! I like caldereta frozen and forgotten and remembered and reheated. I’m all too familiar with what role a bottle of wine plays in certain dishes. Julia Child’s Boeuf en Daube à la Provençal that I cook at least once a year goes down quite a few notches when I skimp on the required good bottle of red. I suspect tolerance for the gamy taste of goat or lamb is probably triggered by the same genetic mechanism as sensitivity to cilantro so you either have it or you don’t. A light whiff of cumin unlocking the floodgate of unwholesome associations is also up there in this tendency. Unless you are a food writer desiring a wider spectrum of flavours for your palette (like Jeffrey Steingarten averred in The Man Who Ate Everything), best to stay away from food that revolts you. 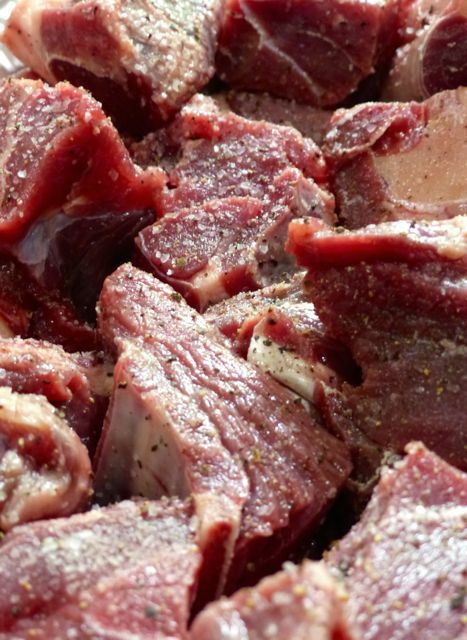 If you’re in a hurry, bring the meat pieces to a boil beginning with cold water to get rid of much of the gamey smell. Wash the blanched meat and discard the water. Alternatively, if you have a couple of hours or more to spare, try soaking it in coca cola. Wash thereafter before proceeding as per recipe. These are the two most cheapest ways to “clean” the meat. Best to use fresh chicken livers instead of liver spread. For say about 2 kgs goat meat, boil 4 pcs. whole chicken livers in water with some salt. Drain and mash, then add to kaldereta as it finishes. The kaldereta tastes much much better than when using liver spread. One of the things I have wondered about Filipino food is how certain ingredients made it into dishes in the way of like putting a square peg in a round hole. Like how liver spread made it into kaldereta or the addition of milk into soup dishes like sopas and mami. The liver spread is just a recent nod to convenience. The traditional Spanish recipe calls for goat meat or mutton and liver stewed in a caldero in a pastoral setting. The cooked liver is then crushed and gets blended into the gravy. When all the ingredients and general procedure are considered, this is one popular recipe that has not really strayed away much from the original. I thought the assertive flavour of goat meat or lamb would benefit from the addition of bay leaf and thyme or even rosemary. While slow cooking, I fell asleep, my sister in laws came to the house. They ate some because they thought it was beef stew. In the mexican meat market, goat meat is called chivo. Wow sarap! . . .I come from abra and i like the aroma and gamey taste of kambing. Our goat purveyor maintains that a horned goat tastes gamier than one with none. In any case, we boil the meat first and (per our old cook’s instructions) wash and clean the bones out. We never had complaints about gaminess. This recipe calls for your sofrito! MM – i haven’t shopped at S&R yet but plan to when I go home. I googled the store and found out that you have to be a member. As I only go home yearly, applying for a membership will just be a waste of money for me. Do you really have to be a member to shop? Do they have a retail branch where one can shop w/o membership? Thanks much. This is one of my most favorite dishes and actually refer to it as one of Pinoys’ “macho” dishes (which includes papaitan!). My Papa makes very good kalderetang kambing. The goat we use comes from our farm and we usually add Bordeaux when tenderizing the meat. Talk about unwholesome associations: A friend who owns forested property came by one day with game meat, among them a dressed rabbit with its paws ( so as not to confuse it with other meats in the fridge, he says) and bear meat. Not knowing what to do with the bear, I thought of using my favorite caldereta recipe, similar to MM’s( sans good wine) but I marinated the meat in Worcestershire sauce and braised the meat in pineapple juice and tomato sauce, then seasoned with patis and added sharp cheddar cheese to thicken the sauce. After a bite of the meat I painstakingly braised for several hours, a funny feeling overtook me, something indescribable and “gross” that I asked myself” Is this how one would feel after eating human meat?” After a mental debate, I left the dish for the rest of the family who ate it with nary a comment. I did not tell them they just had a teddy. Or you could have just chopped off the rabbit’s paw for good luck. Finally after ninety-seven long days adrift Captain Pertwee was rescued, mercifully ending his miserable diet of rainwater and strips of sun dried Haddock which was actually far ghastlier than it sounded what with George Haddock being his former first mate. EEEEWWWW!! Footloose. LOL. But mine is a true story!!! And how in heaven’s name do you get these stories? Quite similar to Life of Pi, except that Pi is more graphic. Apart from washing the goat/bear/rabbit/other exotica with vinegar and salt, adding a pinch of sweet paprika also lessens or subdues the gamey taste of these sort of meat. 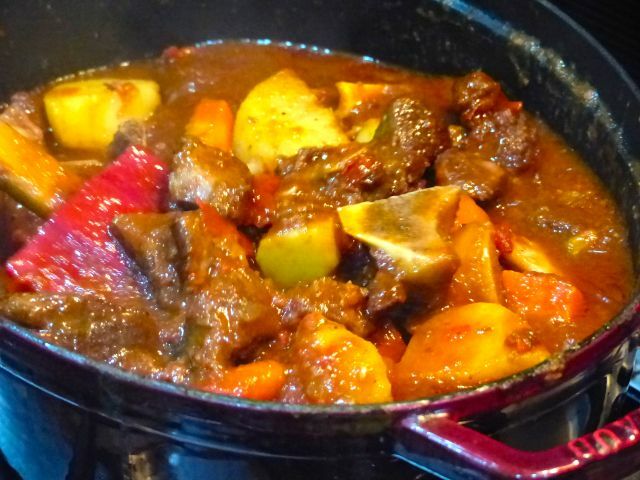 By the way, kaldereta seems very similar to gulasch. I beg to disagree with jdawgg. 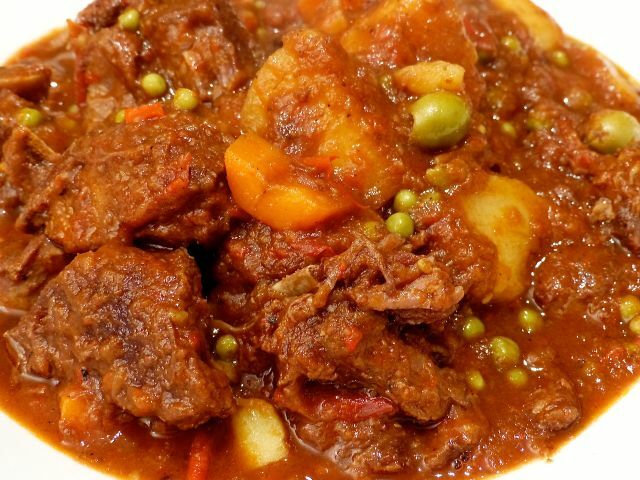 caldereta means stewed meat named from caldera or cauldron in which it is cooked. of course kaldeng means goat in ilocano and kanding in bisaya. 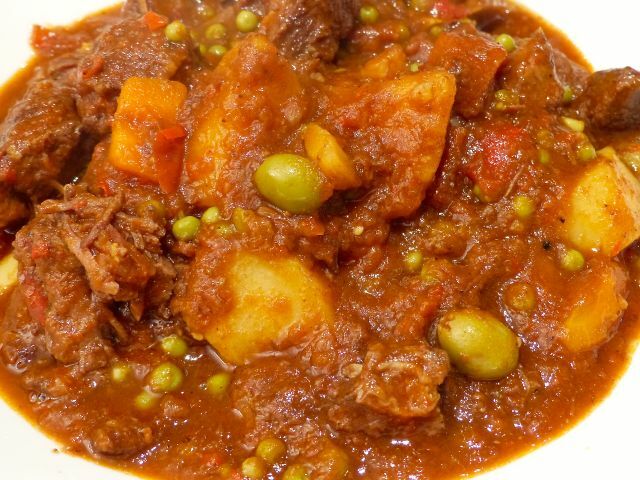 Kaldeng is goat in Ilokano, hence Calderetang Kambing, Calderatang Kaldeng. Interesting etymology, I assumed he was just joking and wondered if he ever considered the derivation of shiitake mushrooms. I don’t know about you guys, but the reason why I eat KK is because its gamey. Try Kalderetang Baka if you dont like it gamey. saj, thanks for that. The one on U.N. Avenue or the one near Bel-Air in Makati? Thanks. My cousins add san miguel beer to soften the meat and it also removes some of the gamey smell. A Christmas Gift For All Marketmanila Readers… From Sister in New York!! !